Loretta Sue (Herde) Myers passed away on April 30, 2017 at Enid Senior Care in Enid, Oklahoma. Loretta was born on October 28, 1938, the fourth of five children, in Blaine Township, Garfield County to her parents, Leah Ruth (Morris) and Raymond Francis Herde. Loretta attended business college in Enid in 1956 where she met her husband, Kenneth E. Welch. They were married on September 8, 1958 and had two children, Leanard Eugene Welch and Ruth Ann Hembree. Later, the two divorced in March of 1975. Loretta married Charles Thomas Myers, "Tom", on January 21, 1977 in Tonkawa and had one child, Tommy Lee Myers. They were married 21 years until his death on September 10, 1998. 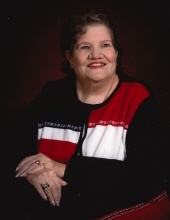 Loretta was a devoted follower of Jesus and a member of Grace Baptist Church in Blackwell as well as a member of the Central Baptist Church in Ponca City. At her church, she enjoyed singing and helping teach the first grade class. She served as the president and vice president of the Blackwell Chapter of the AARP and was a member of the Retired Senior Volunteering Program of Kay County. Loretta continued to be a vital member of her community by volunteering her time at the Top of Oklahoma Museum and helping coordinate food drives for the community and fundraising events for the police and fire departments. Outside of volunteering, Loretta enjoyed writing poetry, doing crossword puzzles, watching old western movies, and crocheting rugs out of bread sacks. She was as fan of the Chicago Bulls and the OKC Thunder basketball teams. She was a caregiver to various family members and enjoyed reading to nursing home residents. Loretta is survived by Gene Welch and wife, Sherry of Tonkawa, Ruth Hembree "Twiggie" and husband, Marvin of Tonkwa, Tommy Myers and wife, Shawna of Rockport, TX, her 19 year old cockatiel, Spooky, Jeana Sharp and husband, Rick of Blackwell, Jr. Myers and wife, Michelle of Longmont, CO, Carla Ellis and husband, Tom of Blackwell, grandchildren, Aaron Welch, Ben Welch, Adam Stanley, and Joel Hembree all of Tonkawa, Destiny Johnson of Rockport, TX, Johnathon Sharp of Virgina, and Trenton Sharp and Jesse Sharp of Blackwell, great-grandchildren, Ryder Hembree, Ashin Howard, JoeLie Hembree, and Klayton Welch, all of Tonkawa, as well as numerous others. Loretta was preceded in death by her sister, Carol, her parents and grandparents, one son, Edwin, and her husband, Tom. A memorial ceremony for Loretta will be held at the Central Baptist Church in Ponca City on Friday, May 5, 2017 at 1:00 p.m. Arrangements are under the direction of Trout Funeral Home and Cremation Service of Tonkawa. To send flowers or a remembrance gift to the family of Loretta S. Myers, please visit our Tribute Store. "Email Address" would like to share the life celebration of Loretta S. Myers. Click on the "link" to go to share a favorite memory or leave a condolence message for the family.